How do we bring more mindfulness, purpose, and ultimately more productivity into our creative businesses? That is the question Brad and I are exploring today. So that we’re in a place where we have a choice over our actions, feelings, responses. We’re not in a state of constant reaction. I think that when we get crazy and too busy, we’re in that opposite space of mindfulness where we’re constantly reacting rather than proactively choosing what we’re doing. We recently finished a book called Mind Time that introduces the approach called AIM – allowing, inquiry, and meta-awareness. A really fantastic read! Especially for those of you interested in mindfulness without the attachment to religion. In it, they quoted a great study from insurance giant, Aetna, who offered mindfulness-based training to their team members. They found the team members who participated in simple training exercises added roughly 60 minutes of productivity per week, which they calculated was worth about $3,000 annually per team member. They were able to achieve a better quality of work through improved attention and reduced distractions, so you can easily understand how this increases your velocity. Improved attention means better quality work. Better quality work means less rework. Whatever you’re doing – whether it’s painting, videography, writing – better attention to your craft is going to result in better work. To create a better quality of work and learn how to use AIM, check out the full podcast. See you on YouTube! Minette Riordan: Hello and welcome to the Structure and Flow Podcast, a productivity podcast for creative business owners like us. Minette Riordan: I’m Dr. Minette Riordan here with my husband, Brad Dobson. We are the co-owners and founders of the Path To Profit Academy and the Creative Business Accelerator where we teach creative entrepreneurs like ourselves how to be more productive and how to use our productivity to actually drive profits because why are we in business if we’re just getting burned out, if we’re unhappy, unfulfilled, and we’re not making money? It’s not a happy place to be. Minette Riordan: Although some days, I wish I could slay more dragons. Brad Dobson: Yes, right. Today, we’re going to talk about mindfulness as a way to actually bring more grace and ease into your business and be more productive at the same time. Minette Riordan: Yes. In fact, over the last episode, last couple of episodes and the next upcoming episodes, we’re in this space of looking at the other aspects of our life that can influence and improve our productivity that you might not think about, and mindfulness is just one of those ways that you can make some minor shifts in your day-to-day practices that will bring more meaning, more purpose and ultimately make you more productive, as Brad said, with a lot more grace and ease. Brad Dobson: That doesn’t really make sense. If we’re going to be more mindful, doesn’t that mean slowing down and being quiet or being more contemplative? Minette Riordan: Weren’t you the one who posted in our Facebook group yesterday about you want to slow down to speed up? Brad Dobson: Well, yes, but most people think about meditation and mindfulness, and I think about slowing down. How does that turn into more productivity? Minette Riordan: You know, I love that, and do you really think that mindfulness is all about slowing down, or is it more about presence and thoughtfulness in the moment? Brad Dobson: Yes, and then, that’s the trick, right? That’s why I said slowing down to speed up, is because taking that time to be aware means you get all these other productivity benefits. Minette Riordan: Right, and I think this is a perfect time to share this awesome quote that you found. You want to share the quote? Brad Dobson: Sure. This is from Viktor Frankl who I had to look up and is an Austrian psychotherapist, psychiatrist, I think. Minette Riordan: He’s also a Holocaust survivor. Minette Riordan: [Maggie 00:03:31], our daughter, loves his books and has read most of what he’s written. Brad Dobson: Oh, interesting. Cool. She’s more well-read than I, I think. Minette Riordan: Actually, she just loves history more than either of us do. She’s quite the little history buff. Brad Dobson: Today’s quote. “Between stimulus and response, there is space. In that space is our power to choose our response. In our response lies our growth and our freedom.” Viktor Frankl. Minette Riordan: I love this quote because I think this is the exact space we’re talking about when we talk about connecting mindfulness to productivity. It’s not about spending hours a day in meditation. It’s abour bringing mindfulness practices into our day so that we’re in a place where we feel like we have a choice over our actions, our feelings, our responses, and we’re not in a state of constant reaction. I think that when we get crazy, when we get too busy, we’re in that opposite space of mindfulness where we’re in constantly reacting rather than proactively choosing what we’re doing in each and every moment of the day. Brad Dobson: Yes, definitely, and we have some things to share. I did a little bit of research, found a great article and I’m hoping to post, which we’re going to link to, just about how adding mindfulness, in a book actually, just as a tangent, that we’ll talk about as well, how adding mindfulness actually improves your productivity. I recently finished a book that Minette handed me called Mind Time. Minette Riordan: We both read it. Brad Dobson: Well, you had already read part of it, or? Minette Riordan: Yes. I read the most important part, the how-to part. Minette Riordan: I don’t read out the story stuff. Brad Dobson: There was a lot of good stuff. I think you should have kept reading. Brad Dobson: Anyways, no pressure. They have an approach called AIM, which is involves allowing, the A part, inquiry and meta-awareness, a fantastic read. Especially for those of you who want to look at mindfulness, MBSR, mindfulness-based stress reduction and meditation without all of the trappings of religious trappings around it or perhaps far-eastern weirdness that you don’t understand. This is a great book for that where you can get into meditation without adding all of those other things. As a Buddhist myself, I’m happy playing in the Buddhist text and learning it that way, but I understand that there’s a lot of jargon that can come with that. Brad Dobson: Anyways, went off on a tangent, but back to this article. There was a great study that they quoted from the insurance giant, Aetna, who offered mindfulness-based training to their team members and found the team members who participated in the training added roughly 60 minutes of productivity per week, which they calculated was worth about $3, 000 per year, per team member, and that was just was simple exercises. The types of things that they were able to add, I think, were really important. I don’t know if you got a chance to read through these, but they were able to achieve a better quality of work through improved attention and reduced in distraction so you can understand easily how reducing distraction increases your velocity. Improved attention means better quality work. Better quality work means less rework. Whatever you’re doing, whether it’s painting, videography, writing, better attention to your craft is going to result in better work. You want to read the next one? Minette Riordan: Sure. I thought these were incredible when you looked at this very specific benefits of mindfulness practice and how it improves productivity, so we’re not crazy. We’re not making this stuff up. Brad Dobson: No, no, no. Minette Riordan: It always makes me happy when I have an idea, and I find someone else’s also corroborated that idea, but able to work more the time because you aren’t sick and stressed was one of the results they found. Mindfulness practices are shown to improve your immune system function, improve the ability to handle stressful situations and improve the ability … I didn’t say that right. Sorry. I’m trying to read the notes, and I didn’t quite get that right, but the point is that a simple 10-minute-a-day mindfulness practice reduces stress, which reduces the production of cortisol in your body, which means you sleep better. When you sleep better, you don’t get sick, and you’re better able to get through fall back-to-school season when your kids are bringing home all the germs form school. There’s nothing like that combination of stress and the fall flu season and lack of sleep to create a total recipe for disaster. Minette Riordan: When individuals get sick inside of companies, companies look at how many sick days impact their bottom line. As entrepreneurs and creative business owners, sick days can take us out and mean the difference between paying your rent or not, right? It’s really important to look at how something as simple mindfulness can impact your physical health, and your physical health has everything to do with your productivity and your profitability. Minette Riordan: Which means? Can you say that again? Brad Dobson: Mindfulness-based stress reduction. Minette Riordan: Said the scientist and the skeptic. Brad Dobson: Oh, yes, yes, yes, yes. Always the skeptic. Minette Riordan: I’m like, “I’m willing to try anything, and I totally get that eastern tradition works.” I’m not someone who needs all the science, and so what I love about this whole conversation around mindfulness and productivity is the science is there. The research is there. The beautiful, spiritual tradition is there, so no matter what your approach to mindfulness and productivity, there are proven results from implementing simple practices. Brad Dobson: Right, so let’s continue on with our list. We got through better quality of work and the fact that you’re not sick as much or you’re more productive. Better decision-making. Minette Riordan: I love this one. Brad Dobson: This is what meta-awareness of our thoughts gives. When we talk about meta-awareness, it’s not just, “Oh, I’m having that thought right now.” It’s … Let’s see if I can describe this better. I guess for the most part, it is, “Oh, I’m having an angry thought right now,” but it’s knowing that, that’s just a thought that’s going to come and go, or perhaps it’s some anger that you need to deal with and you’re able to say, “Oh, I’m angry. I need to deal with my anger.” Similarly for stress or love or any other thing. “Oh, I’m hungry,” although clearly, sometimes, hunger is an actual physical signal as well, but you’ll find lots of research about mindfulness and eating as well where we’re perhaps not mindful of when we’re throwing another Cheeto into our mouth. Minette Riordan: I think this idea of meta-awareness, and I know we’re going to talk more about this when we talk a little more in depth about Mind Time, but this mindfulness practice, as it specifically impacts better decision-making. When you’re in the space of mindfulness and you’re conscious of your feelings and your emotions and your thoughts, you make different choices. Again, it’s this idea that we learn to be proactive instead of reactive throughout our workdays. Again, this is true whether you’re a solopreneur or you’re a creative working for a company and trying to build your side hustle all at the same time. All of these require decision-making, and in many episodes of the podcast, we have talked about how important it is to be able to make the best decisions for where you are in the moment. Minette Riordan: It’s almost impossible to make great decisions from stress. Mindfulness is one practice for being able to feel really confident in your decision-making ability as well, and again, to be proactive instead of reactive. When you’re proactive is when I think it has the biggest impact on your productivity and this idea that you can increase speed by making better decisions as well. Minette Riordan: Who? Me? Crazy thoughts? Minette Riordan: Oh, I love you. That’s my happiness. Brad Dobson: Or depression, or whatever those things are. Well, since they’re happening throughout the day, they’re also going to be happening when you need to make business decisions. Having that meta-awareness, understanding that those are thoughts coming into your head that perhaps they have some importance, perhaps they don’t, perhaps they’re going to just leave your head. Understanding that is going to allow you to then make business decisions without the impact from those thoughts. Minette Riordan: I think the last one is probably … All of these are great, but this one, to me, is so powerful when we talk about the connection between mindfulness and productivity, about the ability to focus on the right tasks because you’re in this space of improved awareness and decision-making. You spend way less time on the wrong tasks. Now, can you imagine, if you’re the owner of the company like Aetna, which probably has hundreds of thousands of employees around the world that when they have employees who are happier, healthier and working on the right task, that has a direct impact on their bottom line, but for you personally, as a solopreneur, so much time gets wasted on wrong tasks, busy work sitting there, spinning, wondering what the heck you should be doing. When you, again, approach from meta-awareness, mindfulness and proactive thinking ability, you know what the tasks are to do, right? It’s just, again, you see that there’s so many great reasons to approach mindfulness, so why don’t we do it more? Brad Dobson: Well, there’s a lot of people that just say, “I can’t meditate.” They base that on, well, maybe they’re not … Maybe they’re really uncomfortable with weird stuff that came out of India. Maybe they tried it once, and they lasted 60 seconds, and it was just horrible because they fail. They felt like they failed. They were distracted the whole time, and they threw up their hands, which you’ll note is exactly the same thing you would do if you tried to step onto the court with a tennis pro and play tennis with him immediately having never done it before, or tried anything new without giving yourself a chance to practice and improve. Those are certainly a couple of big barriers for people. Minette Riordan: Yes, and I think for creatives, that we spend so much time in idea space or daydreaming space that it’s not necessarily that we’re uncomfortable with the quiet time, but maybe it’s this idea of saying that meditation has to look or be a certain way. I think that’s what I really loved about what they taught in the Mind Time book, is when you look at it from a mindfulness perspective, meditation is awesome. Brad and I both talk a lot about meditation, probably more than we actually do meditation, but I would say that we both have other mindfulness practices, and so if we could support you in creating a mindfulness practice, we want to share the AIM concept, idea or concept with you but also talk about some of the ways that we approach mindfulness on a day-to-day basis, so walking, your long bicycle rides. Minette Riordan: Making art, journaling. There are active forms of mindfulness practices. For me, mindfulness is mostly about this idea of slowing down and being thoughtful. I was teaching a time management workshop at a local non-profit for women entrepreneurs, and I actually have one of the creatives raise their hand when we were talking about time-blocking and some of the different strategies that we often teach for time management. She’s like, “But I need time just to daydream,” and I’m like, “That’s exactly right, but you can schedule that time.” I think sometimes, we think that it’s like this magical mystical space, and the secret to success, to me, is aligned more with what we talked about in the episode about morning routines where this is just committing to yourself to take 10 minutes a day, right? Minette Riordan: 10 minutes a day to just sit quietly with your thoughts, not trying to empty yourself of your thoughts, not trying to have this perfect version of what you think meditation should look like but just a pause for 10 minutes a day. Brad Dobson: Yes, and then, you start finding that you’re able to take that pause to more and more times during the day. Quite literally, with that 10 minutes a day, you’re training your brain to be able to make those better decisions and just, it gives you a chance to think about what you’re thinking about instead of having those thoughts own you. Minette Riordan: Makes me think about [Maya 00:18:18], one of our clients who was an amazing coach and did beautiful work with people. She lived by the train station. Every time the train came through, whether she was seeing people virtually or in person, she used the train as a mindfulness pause. You can’t talk over the sound of the train, so it became this beautiful organic moment to just pause, to breathe. Even in my depth coaching program yesterday, we talked about how can you reframe conversations, especially if you’re having difficult conversations or if you’re feeling that overwhelm that so often happens for entrepreneurs. How can simply just taking 30 second, five seconds even, to just pause, take a few deep breaths, stand up, move your body. These are simple mindfulness practices that can have a deep impact on your day-to-day mindset. When your mindset is happier, guess what? You’re more productive. Brad Dobson: You bet. Bow can you learn more about mindfulness? We’ve got some links for you in the show notes. You can also do a little of your own homework. Look for the term MBSR or mindfulness training. You can look for the book Mind Time. Minette Riordan: You’re actually going to talk more about Mind Time and the AIM process? Brad Dobson: Well, I talked about it a little bit at the beginning. I’m not sure how much we want to push forward on that. Minette Riordan: Well, I think we should say a little bit more about it because it was pretty impactful. Brad Dobson: Yes, and I guess the neat thing about it is, they describe their process and the why’s of it, similar to a lot of the things we just talked about. Then, the subsequent chapters show how you’re able to apply their process to relationships, to your work, to your exercise and your food, so they have very specific chapters related to each one of those with what I thought were just fantastic Joe or Jane on the ground type of testimonial. Not testimonials, but stories from people that they work with. From what I can tell, they work with thousands of people with this type of stuff, so they’ve seen it all, heard it all, and the stories they give are fantastic. Brad Dobson: One that stuck in my mind was someone who was having problems detaching from work and coming home. They used the five seconds while they were putting the key into their home door when they got home to actively make that transition. I don’t know if I’m describing it very well, but it was a good example. Maybe you do that when you go up to your car next time or when you come back to your house where you’re able to just pause for a second as you’re putting the key in the door. Think about where you are, what you’re thinking about and perhaps change context. Brad Dobson: Right, so the A in AIM is for allowing. That’s a critical starting point. Most of us struggle with being compassionate with ourselves, certainly with other, but that’s a key first step, is allowing things. You are allowing those angry thoughts or those crazy thoughts or whatever it is that’s coming into your head. You’re allowing that. It’s just what your brain is doing at that point. Minette Riordan: Yes. They describe it as allowing is having two parts. The first part being wisdom or knowledge, which is just recognizing that you’re having the thought, and then the second half of the allowing is being compassionate with self first, because when you’re compassionate with self first, then you have more compassion for others in the moment as well. Minette Riordan: Literally asking yourself the question. Again, this is the pause, right? When we talk about mindfulness, it’s so much about pausing, is really stopping to reflect. “What’s going on here? What is this feeling,” like putting a name on the feeling. Go, “Oh, I’m angry. I’m hungry. I’m tired. I’m stressed.” When you can name it, then you can again make that different choice, which leads right into the M, which is meta-awareness. Brad Dobson: Right. You can name it, so meta-awareness, we’re labeling things. We’re naming things. We’re looking at ourselves from above or from the side or wherever you want to look at yourself and saying, “Oh, that’s a thought. That’s a thought that’s coming into my head, and there it goes. Now, I’m having another thought. Now, I’m reacting this way to this situation.” It’s that meta level of awareness, not just what you’re seeing with your eyes, what you’re hearing or that thought taking over you or you reacting to that thought, and that thought then causing you to grimace or whatever. It’s you stopping for a millisecond or a second and being aware of that thought. Minette Riordan: Their recommendation is that you use this AIM practice 10 minutes a day. They say the more people do it, then the more impact that it has. Brad Dobson: But it’s got to be a minimum of 10 minutes a day. Minette Riordan: A minimum of 10 minutes a day and 10 consecutive minutes, not three, three and four, right? Minette Riordan: 10 consecutive minutes of sitting in this process of allowing inquiry or inquiry, as Brad says, in meta-awareness. Minette Riordan: Yes. It’s so simple. Brad Dobson: You could be walking. You could be sitting, whatever, doing the dishes, whatever it is you want to do but you’re not going to be talking to someone at this point. It’s just a quiet thing. Minette Riordan: Yes, and it’s so interesting because it’s so easy for me when I’m making art to get caught up like have a Netflix show running in the background or listen to podcasts or listen to a book, but I can actually make it a mindfulness practice and use this AIM process if I’m just in the moment with my art. I’m allowing. I’m in the process of inquiry, paying attention to meta-awareness. What I notice is, I have a lot of judgment sometimes about what I’m creating, and I can go, “Oh, why am I being so judgmental? Where’s my compassion?” Then, I go back to that allowing again, to the, “Oh, I’m being judgmental,” and being more compassionate so that it keeps me connected to the process. Again, walking, running, biking, sitting quietly. Swinging would be a really fun one, lying in a hammock. This is not go sit on a cushion. It doesn’t have to be. It absolutely can be, and we do recommend that as well, but it’s finding a way to create this 10-minutes-a-day mindfulness practice for yourself. Minette Riordan: We’d love to hear how it goes. What’s the impact for you? 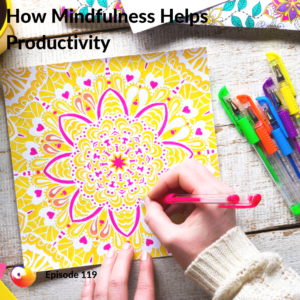 You could leave us a comment on iTunes or go to our show notes page at pathtoprofitacademy.com/podcasts and leave a comment on the show notes for this episode and let us know how mindfulness and productivity are connected and successful for you. Brad Dobson: Yes, and when you get frustrated because it didn’t work the first time, that’s okay. You can allow that. Just keep going. Minette Riordan: Yes, just keep swimming, just keep swimming. Brad Dobson: Cool. What have we got on tap for next week? Minette Riordan: In episode 120. This has been part of our own personal journey to living a better, more productive and more fulfilling life with more grace and ease, is by really paying attention to what are we feeding ourselves on the inside? Mindfulness is about, how are we nurturing ourselves in and out, and diet is really going to look at the impact of food. Brad Dobson: That four-letter word, starts with F, food. Brad Dobson: What you eat. Minette Riordan: Every single day, and it’s not about us preaching about one diet over another one. It’s about just that consciousness and that mindfulness around how what you’re eating is supporting your productivity. Brad Dobson: Cool. More on that next week. Minette Riordan: All right. We’ll see you then.